Who knows what evil lurks in the hearts of men? The Prince of Evil knows in this exciting Shadow Pulp magazine from 1940! The Shadow pulp magazine on sale now. While The Shadow pulp novels were usually written by Walter B. Gibson, there were several instances where other writers stepped in to write the novel. This was the case with this issue, wherein the lead story was written by Theodore Tinsley. 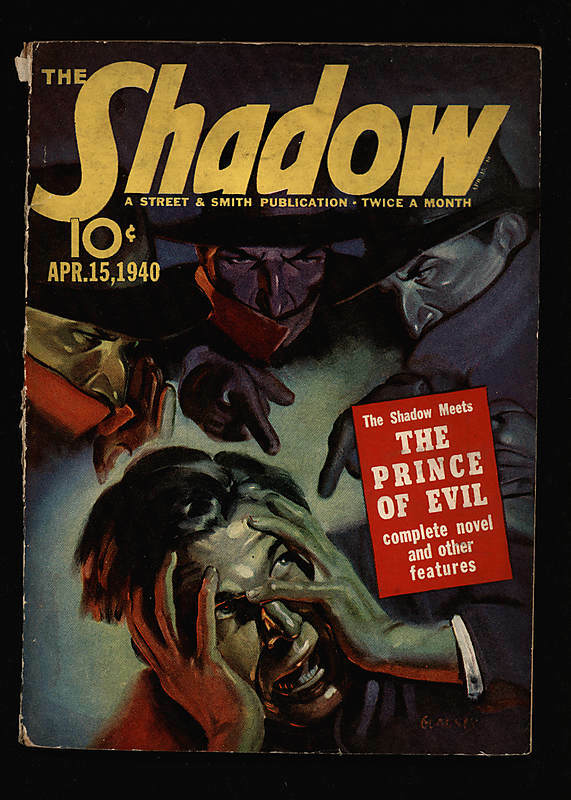 Also included in this issue of The Shadow pulp magazine are the stories “Jimmy’s Lemon” written by George Allan Moffatt, The Shadow Club and “Codes” by Henry Lysing. Highlights on the Shadow is a twice monthly feature where readers write in to praise and criticize the previous month’s offerings. This Street and Smith publication was published twice a month and is rated a 6.0 by Overstreet grading standards. The cover is gorgeous with great color retention and only a bit of chipping on the upper and lower spine. This Shadow pulp magazine may be purchased directly or bid upon by going to the Comic Connect link here.